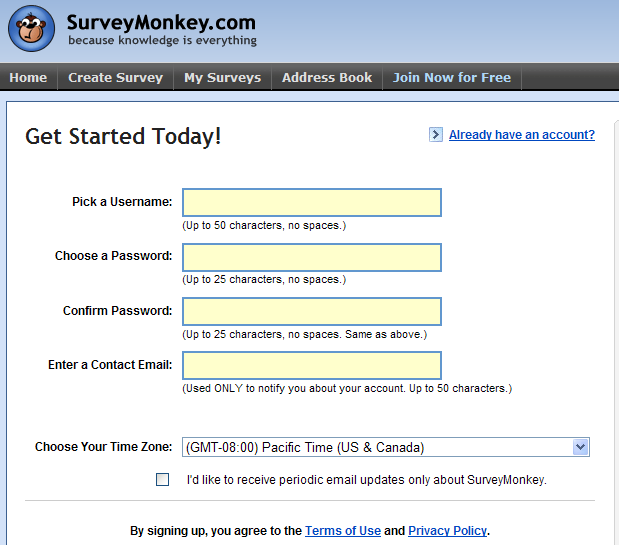 Our first detailed review is for Survey Monkey. 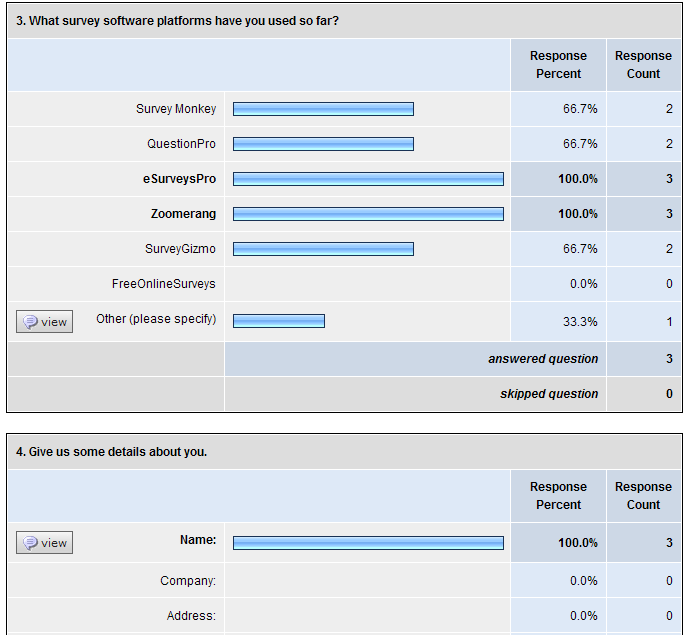 SurveyMonkey.com seems to be one of the most used survey software tools. We will try to see why. This review is written while we are performing the tasks, step by step. Signing up for a free account is very easy. It takes less than a minute because you only need to enter a few details (see screenshot below). An email confirmation of the account creation follows shortly. We will try to create a new survey to see how easy/difficult that can be. 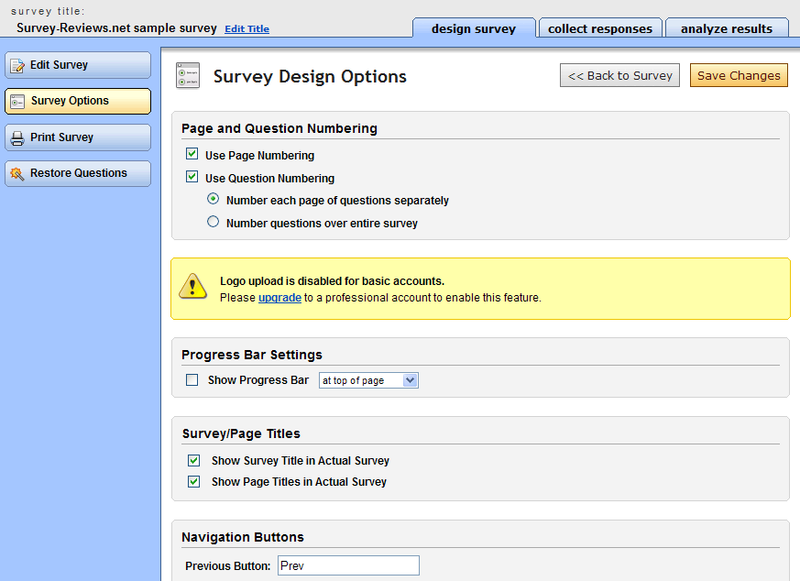 First page is the survey creation page. 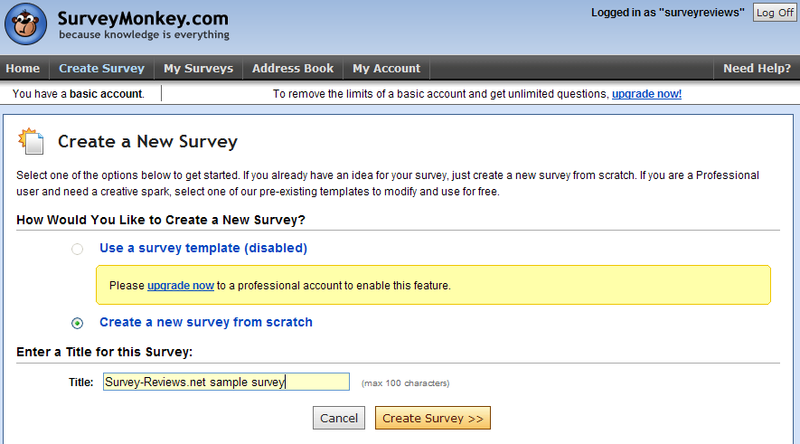 The survey template library is disabled for the free accounts. We can just create our survey from scratch. We get redirected to a page where we can add the survey questions. The survey editor looks nice. The look of the survey can be changed. You can choose one of the 15 predefined themes. Clicking on “Add Question Here” makes a popup with the question editor appear. Personally, I am not a big fan of the popups. In my browser I would prefer to go to a new page when I click on a button. 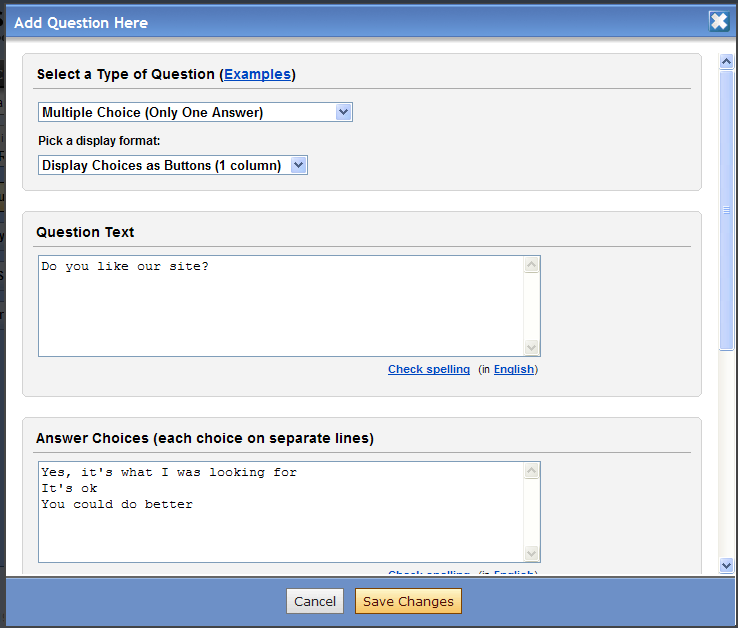 Another thing we have liked in the question editor is the possibility to validate open text fields. You can validate the length of the text, make sure it’s a whole number or a decimal number, make sure it’s a valid date or email address. We have easily created a survey with 6 questions. 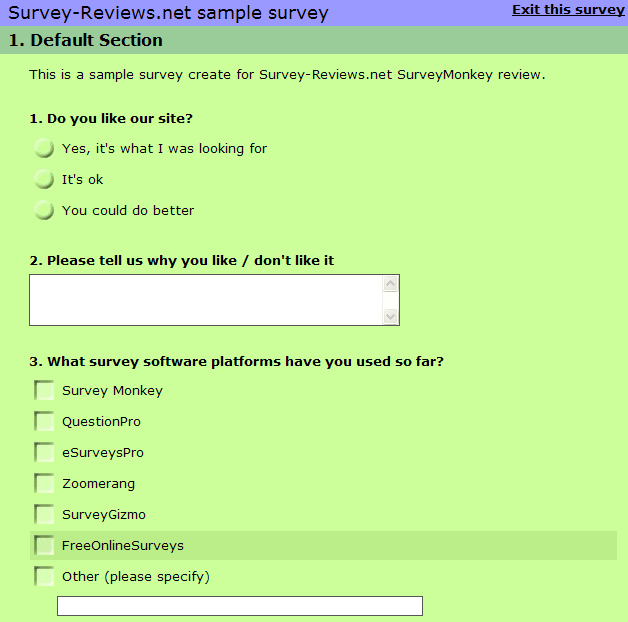 SurveyMonkey has a nice preview page where you can see how your survey will look into your respondents’ browser. It’s time now to start collecting some responses for our survey. Since the preview url warns us not to use it for live data collecting, we have to click on the “Collect Responses” tab located at the top of our survey. We have entered some responses and now trying to generate the report. 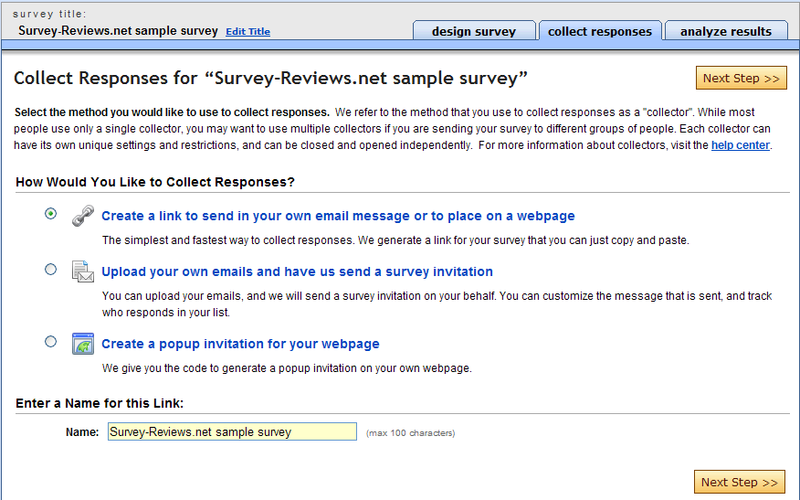 Clicking on “Analyze results” tab in survey, you get sent to the “Response Summary”. The report does not look too spectacular but it’s ok I guess. You also have the possibility to browse individual responses. That’s about it so far related to SurveyMonkey.com. The responses collection, although it’s powerful, it’s a little bit too complicated. Most of the users will just need a url to put on a web site. You only get 10 questions and 100 responses per survey for the free accounts. I guess it’s ok for academic purposes. Wow, what entice you to post an article. This article was extremely interesting, especially since I was searching for thoughts on this subject last Thursday. @Yonis Why don’t you make some suggestions. This topic is quite trendy in the net right now. What do you pay the most attention to when choosing what to write ? @Ex Girlfiend we try to pay attention to any survey software plaform, big or small. Of course we will study more the better known providers. Cool site, you have inspired me to try and make one myself haha. You have a lot of useful information here. However you haven’t mentioned Limesurvey – is there a reason for this? I am very interested to hear what you think as I work for a large organisation and we are looking for a coprorate survey tool that every department can use – is it possible to do this for free? Thank you so much for the reviews of survey software. We are looking to buy for our small company and these reviews have really helped us understand what works well and what enhancements would improve these products – saving us a ton of time (and money)! 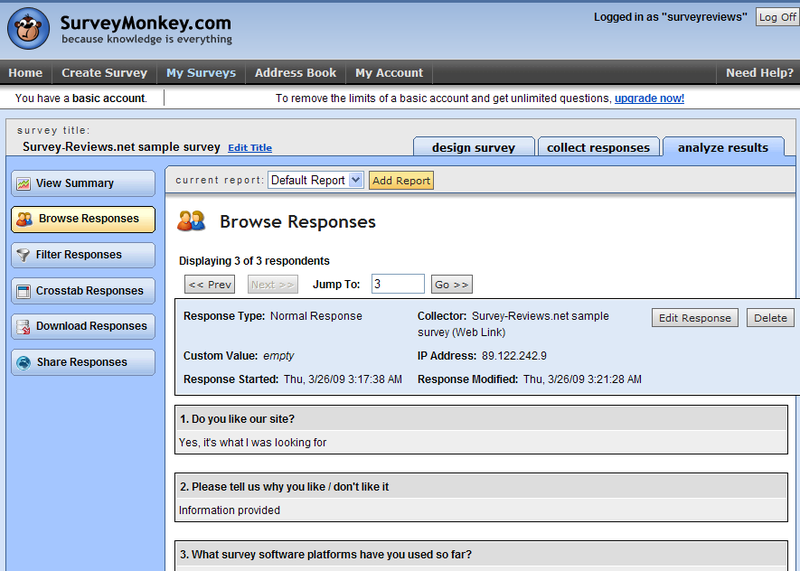 is there an option in Survey Monkey for the respondent to save or print out his reply. Your review has been helpful. Are you going to review Qualtrics? or Vovici? I use CreateSurvey, it is easier, they customize it for me, and put my hard copies, that were in paper, into database. 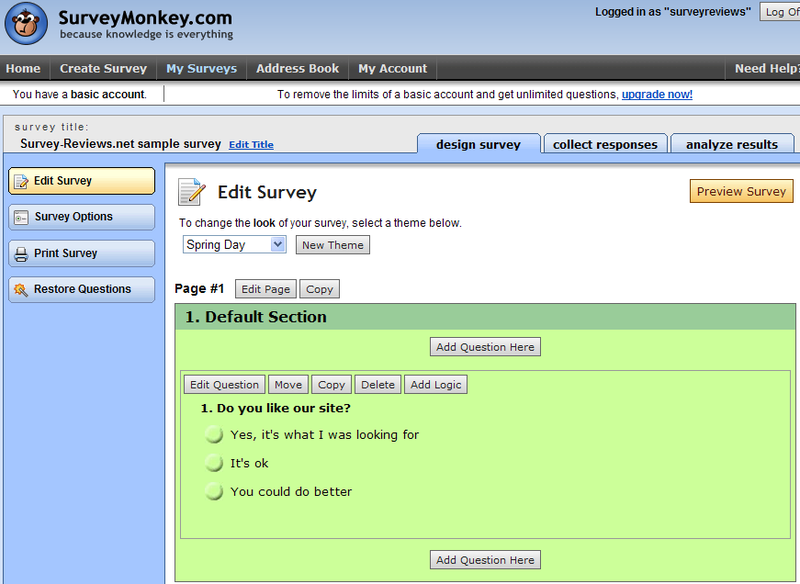 Nice brief review of SurveyMonkey. Good to know the technical creation of SM. Are SM’s surveys popular more for the companies that use these or for the people actually filling these out?? I would’ve liked to know much more about participants’ own experiences filling out SM’s surveys. And to know their experiences from NONSurveyMonkey people. SurveyMonkey has SERIOUSLY downgraded what is available to free users, and it’s paid plans are prohibitive for non-business users. With a free account, you cannot even print your survey responses! Even if you try to print them using your browser’s print function, SM has thrown a “monkey wrench” into the works and not all the answers show up on the print. Also if you have open ended responses, you have to click to open and see them. But if you click to open one set, it closes the other sets. So, the most you could even print, if that Q&A will even print, is one set of free text responses. Obviously, you get what you pay for here, but it is too bad that SM has so severely degraded the experience for early and first-time users. What a bad way to experience a new and valuable tool.